Rob is a graduate of the University of California, Santa Barbara and received his graduate degree in communications from the University of California, Los Angeles. Rob worked as a business and management consultant to advertising, corporate communications, and media production companies as well as many others. Now retired, he resides with his wife in Southern California where he devotes much of his time to writing. He is a recipient of the Samuel Goldwyn and Donald Davis Literary Awards. An affinity for family and the astute observation of generational interaction pervade his novels. His works are literary and genre upmarket fiction that address the nature and importance of personal integrity. The blast from the shotgun decimated his face, leaving behind a gory mess of brains and blood. That’s how Luther Baggot, a bounty hunter assassin, slays his victims. Employed by Rudolf Palm, a highly placed sadistic police officer in Otto von Bismarck’s secret police, Baggot is after a list containing the names of influential social democrats who fled Bismarck’s tyrannical regime. Two of these families are the Josephsons from Sweden and the Wohlman brothers from Germany, both of whom took refuge in America. The Josephsons settle on a farm in Minnesota, and the Wohlman brothers establish a successful business in Chicago. Unfortunately, Baggot tracks down the Josephsons and kills Olaf and Ingrid Josephson. Consequently, the Josephson children, Newt and Julie, along with their friends Aaron and Beth are forced to flee. They hide in a logging camp up north and ultimately land in St. Cloud. There they meet Matias Bauman, alias Heinrich Wohlman, a former friend of the Josephsons. He takes them to Chicago, an unfamiliar world to them, where they are plunged headlong into the bedlam of urban politics and the violence of their past. 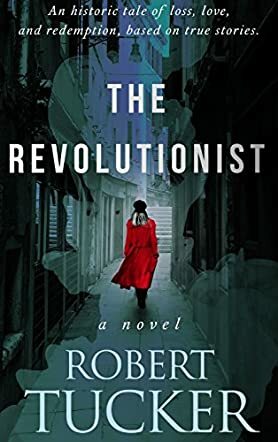 The Revolutionist by Robert Tucker is a well-researched, gripping work of historical fiction. Tucker weaves an intricate tale of political intrigue, violence, hope, and redemption. Supported by a large cast of characters, including J.P. Morgan, the book delivers an entertaining, immersive story with eloquent descriptions of America on the cusp of the Industrial Revolution. Tucker has sketched a bare-knuckle portrait of twentieth-century America, revealing its seedy underbelly along with its prosperity. Thanks to Tucker, I got a glimpse of America teeming with immigrants from all over the world who became a part of her history. This novel also shows humanity at its worst and its best. It shows how the avarice of a few powerful men breaks the spirits of thousands of hard-working men and women and how, despite all odds, the resilient human spirit always survives. Moreover, Tucker brilliantly interlaces the coming-of-age story of Julie within this historical fiction. Her metamorphosis from a frightened child to a determined girl seeking revenge transpires quietly, which provides a satisfying dénouement. The Revolutionist is recommended for fans of historical fiction and for those seeking a great story.